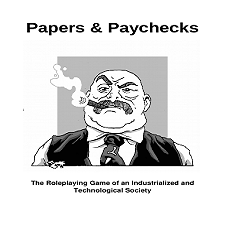 Papers and Paychecks is a roleplaying Game of an Industrialized and Technological Society in which you play the part of workers and students gloriously trying to succeed against a world of antagonists, and an antagonistic world. A humorous but somehow threatening game set in a dystopian office, just like the the ones we know and hate, but somehow slightly different. Did the coffee machine just gurgle a threat, did anyone else hear that?